By Jennifer Burcke on April 21, 2013 Visit Jennifer's Website. I feel like we have been waiting for spring’s arrival for months. Perhaps that’s because we have. Winter was long and harsh this year. We saw more than our fair share of snow and endured a lot of cold weather all with an eager eye on the first day of spring’s arrival. We have passed the day in March that signals spring’s return. Of course, as New Englanders, we fully expect for that date on the calendar to pass with several weeks (or perhaps months) to wait before spring truly returns. Last week, I found myself shaking my head and watching as snow and freezing rain fell rapidly from the sky. It seemed as if this long winter would never come to an end. While locals and meteorologists prognosticate about temperature warming trends and the coming season’s outlook, I pay little attention. I don’t need to. Instead, I wait for the animals to predict the weather. I find that they are much more effective at forecasting the weather the lies ahead. Several weeks ago, the goats here at 1840 Farm heralded the arrival of spring. Tufts of soft undercoat started to appear everywhere we looked in their barn and pen. While the temperatures still felt chilly to all of us, they were clearly preparing for the arrival of warmer temperatures and sunnier days.Then the hens decided to follow suit. They welcome spring to 1840 Farm in the most delicious of ways: by leaving a surplus of beautifully fresh eggs in the nest boxes every day. During the last three weeks, we have found ourselves collecting up to 14 eggs a day from our 17 heritage breed hens. Gathering over five dozen fresh eggs each week certainly puts me in the mood to celebrate the arrival of spring! Our five bantam hens that live in our garden coop have joined in the celebration. This is their first spring, and they seem to be very pleased with the warmer temperatures and longer days of sunshine. During the month of April, their weekly egg production has rocketed from around 5-7 eggs to between 12-15 lovely fresh eggs. In the coming weeks, our beautiful little bantams will begin the work of tilling the raised beds in our garden. The full sized hens will enjoy longer days spent outside and so will all of us living here at 1840 Farm. It will be time to prepare the garden beds, plant seeds, and continue to tend to the seedlings living in our improvised growing chamber. When we harvest the first full meal from the coop and gardens, we’ll all be ready to celebrate the arrival of another growing season. This year, I have even more reason to celebrate. I have been collaborating with fellow Community Chickens contributor Jennifer Sartell from Iron Oak Farm on a project for those of you who love gardening as much as we do. The 1840 Farm Heirloom Seed Collection contains some of my favorite varieties of heirlooms to grow in the gardens here at 1840 Farm. All of the seeds are heirloom and non-GMO. 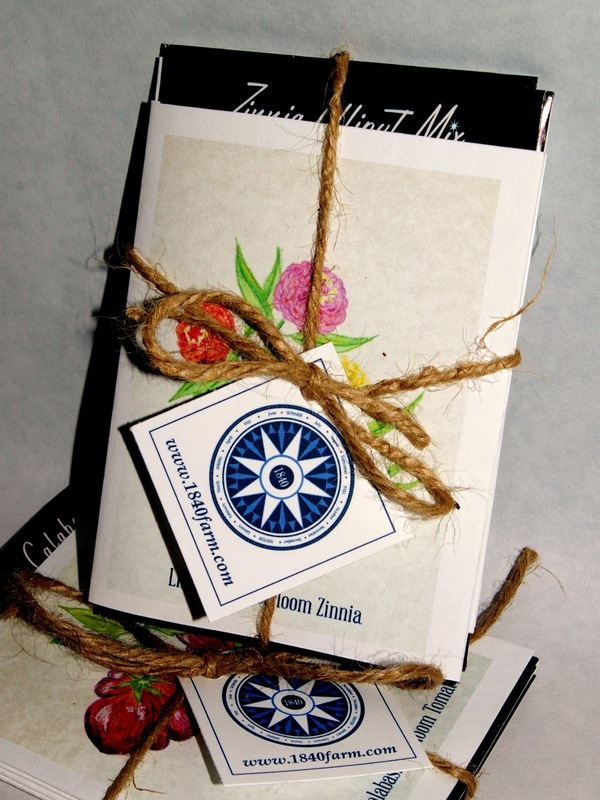 Each packet comes with Jennifer’s beautiful artwork, planting instructions, and a detailed description of the heirloom. The edibles come complete with my family’s favorite recipe so that you can enjoy them around your family’s table. Have you written about your garden coop, for the bantams? My chickens are giving me plenty of good eggs now that it is warmer.One hen just started sitting on nine eggs so I am excited waiting on baby chicks! 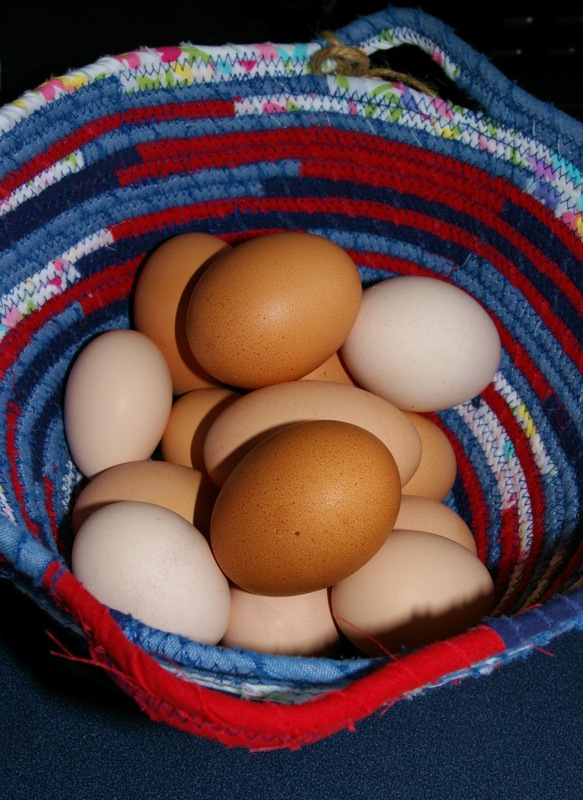 The hens are finally starting to fully produce again – hurray! I’m still clearing trees to get some sun in for gardening. Mostly a bunch of standing deadwood that was a hazard anyway. It’s a long road, but I’m thinking of making raised beds and putting the wood at the base to retain water as it breaks down (hugelkulture). Next big projects are putting together a chicken coop and figuring out where all the now potted perennials from our other house can find happy homes at the new place. Would lobe to have some heirloom seeds for the garden. If not, it was still cool to see your site. Getting ready to make some new raised beds. My 18 chickens have gone into overdrive!! 3 days ago we got 31 eggs!!!!!! I didn’t even know that was possible!!!! And YES! I did collect 11 eggs the day before!! Heirlooms are my fave to grow. Thanks for the giveaway! We are in the process of building our first coop and awaiting the arrival of our first flock. Hopefully by this time next spring we will have moved into our new house and be getting ready for buying some alpacas. Time to plant in northern MA. Chickens are done scratching up what was left of last year’s garden. We have chicks and are eager to raise them into chickens! just getting baby chicks now, as our older chickens laying is slacking off big time. Time to refresh the flock! I just got 4 ladies on Friday!! I’ve gotten 3 eggs so far.. i’m lovin’ being a chicken mommy so far! I grew some heirloom tomatoes several years ago. For some reason I haven’t tried again. I am anxious to get back at it. I especially like your photos. I love all your advice for backyard chickens!!! What a great collection of heirloom seeds. I love planting heirloom and would love to win these to plant ! the egg laying has picked up and all the animals are so happy to have warm temps. coming to mi.I would love to try the heirloom seeds haven’t really grew any yet. Love to win some seeds, and love your packaging! I would love to win the heirloom seeds too. That is all I grow and so far this year, my seedlings are looking pretty good! As I’m writing this, I can hear my roosters crowing about the start of what is sure to be a beautiful day! I just got my seeds and am setting up my grow light with my 11 year old grandaughter whom loves to garden with me We’d love to win some heirloom seeds. The last of our snow left yeserday. Yay…Spring is here. Now off to do the Spring coop makeover…. Absolutely stunning photos to accompany a great post. I would love some heirloom seeds ! Spring is finally here in northern Minnesota. My girls have been rummaging around the yard looking for bugs. We can’t wait for things to get growing ! We love heirloom seeds too! No animals although we are thinking of getting chickens. Right now we are just gardening. 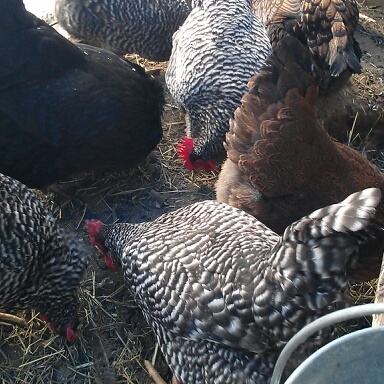 I have chickens and a few goats and try to keep everything organic, heirloom, and heritage. I would love to win your tomato seeds! I have loved reading these comments today. It’s so nice to know that I’m in such great company with other chicken keepers, gardeners, and homesteaders who share my passion for producing food for our family table! I love heirloom seeds! My garden is my therapy and a great way to free your diet of all the processed foods and chemicals. Our hens have been laying non stop. giving us more eggs than we can use. 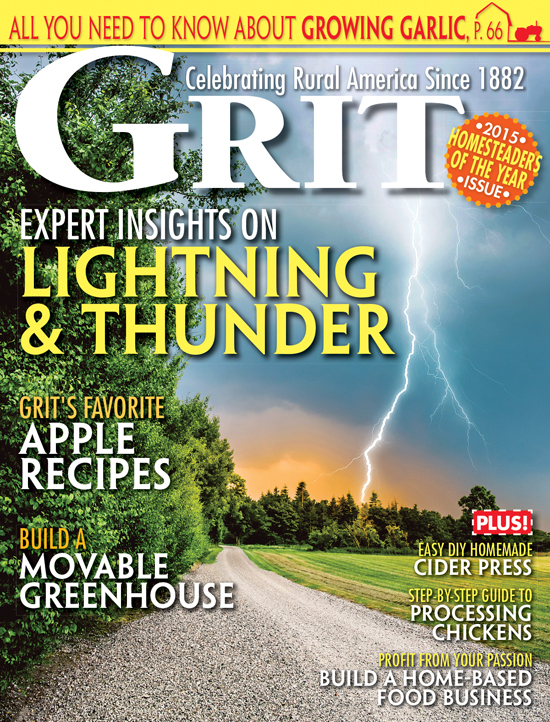 Another great giveaway that is supporting the homesteading movement! The more people that realize the benefits to themselves, their families, their friends, and their communities, the better our world will be! Good luck everyone! My green beans started to come in yesterday.. 5 beans so far and one jalepeno… more to come.. especially if I win those seeds!! We are getting more eggs in just the last few weeks. The cows/horses are slicking off their winter coats. We will be gardening! Plus I planted my first herb garden. Exciting. I would love to win some tomato seeds! Thanks for the chance to do so! Our chooks are loving the longer days! We just started our first flock last year, and hatched our very own birds this spring. Working on starting our first garden this year, too, and I’m campaigning for goats, next. Plowing today, and I’m growing grains for my chickens and food for my family. 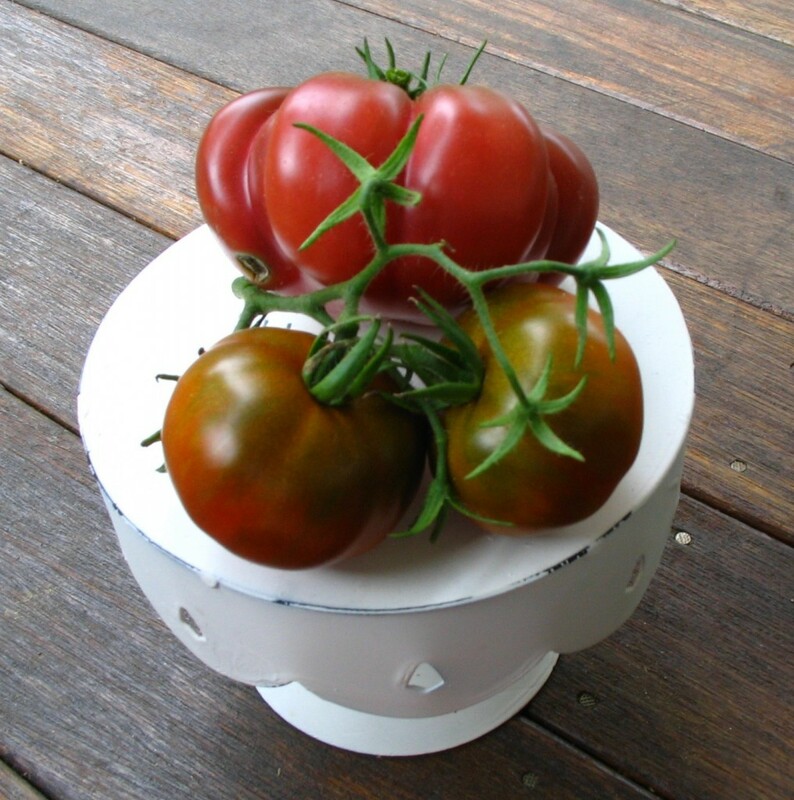 We love tomatoes….I already have 3 varieties going for a total of 30 plants! I have my garden beds ready! My garden plot was just plowed yesterday! :/ Can’t wait to get my fingers in the dirt! Yes, our hens are giving us eggs. Our dogs are happy to have the whole family outside with them and are running around like crazy. We just got chickens…24 to be exact…for our intentional community of 10 families. Can’t wait till they start laying!